Most broadly, goat cheese is simply any cheese that is made with goat milk, as opposed to cheese made from milk from other animals (like cows or sheep). Goat cheese is sometimes thought of as only the soft, popular, and spreadable cheese known as chevre (which means "goat" in French). However, there is a wide variety of goat cheeses available, ranging from soft to hard, tangy and sweet, and everywhere in between. The layers of flavor that give goat cheese its complex and sometimes funky character can make pairing it with wine a challenge. With some careful attention, it is possible to find a wine that results in a harmonious pairing with goat cheese, one that will show off the flavors of the cheese and the wine. If in doubt, a safe bet is to choose a wine and goat cheese combination from the same region. This natural pairing provides similar taste profiles and showcases the regional variety of both the goat cheese and the wine at the same time. Getty Images/Derek Cooper Photography Inc. This classic pairing is also a regional one. France's Loire Valley is famous for both chèvre and the Sauvignon Blanc-based wine Sancerre. Albarino is a white Spanish wine known for its bold acidity and citrusy flavor. It is a crisp, clean wine that can stand up to the tangiest of fresh goat cheeses. Fresh goat cheese tends to be more creamy and the bold wine provides a nice counterbalance to the fresh taste of goat cheese. Riesling rarely meets a cheese it doesn't like. The wine offers everything from a lush texture and fruit-forward taste, refreshing acidity, and a long flavorful finish. Fresh goat cheeses with a mellow, milky flavor pair well, as do aged goat cheeses with a harder texture and earthier, floral flavor. Either choice will bring out the floral, fruity taste of the wine. Choose Chardonnay with a creamy texture (but not too much oak) and refreshing flavors of apples and pears, perhaps a French Macon-Villages, Pouilly-Fuisse, or Chablis. Serve Chardonnay with aged goat cheeses, such as Spanish Garrotxa, domestic Tumalo Tomme, or Sunlight goat cheese to balance out the rich cheeses and showcase the wine's fruit flavors. Reach for a bottle of Syrah from Washington state or California, one that has big flavors of ripe summer berries. The lush fruit will mellow out the funky, bitter flavors that some people find overwhelming in soft goat cheese. If you are looking to add some variety, Syrah can also pair well the sweet, rich flavors of goat gouda or goat cheddar. 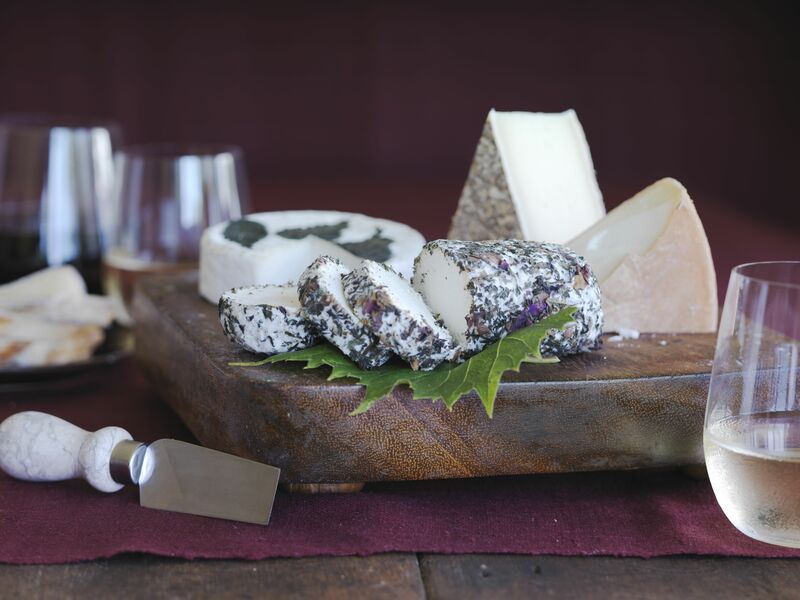 Look for Midnight Moon or Chevre Noir cheeses to balance well with the boldness of a Syrah.